Here’s a great way to recycle a styrofoam egg carton, and make a cheerful Christmas candy wagon decoration as well. All you need is the egg carton, some styrofoam balls, glue, a bit of ribbon and some Christmas greenery. Oops, almost forgot – you’ll need some nuts and candy too! 1. Cut off the egg carton lid. Wash the bottom part of the egg cartoon with hot water and soap and dry thoroughly. 2. Starting in the middle of one long side, glue the ribbon all the way around the egg carton, close to the top rim, overlapping the edges of the ribbon where they meet. 3. Cut each of the two styrofoam balls in half. Now you have four half balls. Take each one of these segments and slice a small part off the rounded end. Glue these circular segments to the ribbon on the egg carton, to represent four wheels. Make sure the “tires” are upright and securely fastened with glue so they don’t snap off with the weight of the candy. 4. Glue a ribbon rose in the center of each wheel. 5. Pull apart the picks of Christmas greenery – this may be artificial holly leaves, cedar boughs or something similar. Begin gluing small sections of greenery to the wagon, overlapping a little as you work your way around the outside. Allow the greenery to overlap the rim of the wagon just a little. When you are finished the outside, glue a little greenery to the center section as well. 6. Finally, fill your candy wagon with an assortment of nuts and candy. As I make a craft, I often think of other ways that it might be done – so next time I try this project, I might put a Santa or snowman at the front, with a steering wheel made of black fun foam in his hands. Also I might put bows on the sides and the back of the wagon. 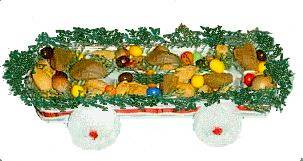 I’m sure that you can think of other ways to make your own version of this Christmas Candy Wagon Craft. Enjoy!